It is time for another design challenge with My Inky Friends! This one is based on a card layout on page 122 of the 2018-19 Stampin’ Up! catalog. Here is my creation. I used Dashing Deer and Detailed Deer Thinlits. I think this is my favorite Christmas bundle in the Holiday Catalog. The Crumb Cake card base has a Crumb Cake layer that I ran through the Corrugated Dynamic Textured Impressions Embossing Folder. The sentiment is from Merry Christmas to All. I colored it and the swag with Cherry Cobbler, Mossy Meadow and Crumb Cake markers to get the multi color images. It is hard to see in the photo, but the Cherry Cobbler circle was stamped with the Burlap background stamp before I cut it out with the Stitched Shapes circle. I finished off with a few strips of Festive Farmhouse designer series paper and some Linen Thread. Make sure to check out what the rest of the design team has created for this challenge and then play along! Make your own creation based on the sketch and share it by linking it to the My Inky Friends page. Welcome to My Inky Friends: Handmade Holidays Blog Hop! You will find lots of inspiration for you Holiday crafting! You should have arrived here from Paula and her wonderful Country Home projects. Weren’t they great? If you are starting the hop here, make sure you go through and check out all the stops. You don’t want to miss a thing. My projects are putting the fantastic set Merry Christmas to All in the spotlight. This is a great holiday greeting set and the coordinating Merry Christmas Thinlits take it to the next level. I just love the dimension and texture of die cut words. I paired this great set with the amazing Joyous Noel designer series paper. I love the new Merry Merlot color. Paired with a touch of copper, it is perfect for elegant holiday projects. I decided to create a card, gift package and ornament trio. Let’s start with the card. Isn’t that paper gorgeous!? I also used a bit of Neutrals 6×6 DSP (the Crumb Cake dot panel) I layered a Pearlized Doily with a Stitched Shapes circle cut from Wood Textures DSP. A tiny bit of Copper Glimmer Paper draws out the copper foil in the Joyous Noel DSP. I also added a tiny tree from the Festive Farmhouse Elements. The sentiment is stamped on the Wood Texture DSP in Early Espresso Ink. I think it gives a wood burned look to the image. Next up is a cute little gift card pouch. I started with one of the Kraft Pillow Boxes. I just love those little white polka dots. I kept some of the elements from the card, but changed them up a bit to make the belly band wrapped around the pillow box. Finally, I made this fun medallion ornament. I started with two 4″x12″ strips of the DSP. I scored them every half inch, fan folded them the assembled them into the medallion. Once again I used the Pearlized Doily and a Stitched Shape circle, this time cut out of Crumb Cake card stock. I added a few snowflakes from the Blizzard Thinlit with added rhinestones. A fabulous trio perfect for holiday gifting! I am now sending you over to Rhonda and her fun projects with the tiny take-out box! They are so much fun! I used the A Big Thank You stamp set and coordinating Thank You Thinlit. The small images work great to create your own background paper. The Crumb Cake card base is embossed with the Corrugated Dynamic Textured Impressions Embossing Folder. I just love the texture and dimension it gives. I added two little ribbon loops on the top left corner of the image panel to finish it off. I let the die cut thank you hang off the image panel a bit to pull it into the card base some. I think it helps it stand out more. Head over to the My Inky Friends page and check out the other design team creations, then have a go at this color combo yourself! Be sure to upload your creation to the My Inky Friends page so we can share in your creativity! That’s a wrap for today. Join me again to put a spotlight on creativity! Welcome to My Inky Friends 2018 Holiday catalog Showcase blog hop! We are shining the spotlight on some of the great new stamp sets in the Stampin’ Up! Holiday Catalog. If you are following the hop in order, you have come here from Cindy and her wonderful Winter Woods display. Now, join me as I put the fantastic Wishing You Well set center stage. I love a versatile set and this one really is great for any season. So, let’s take a look at some of it’s many talents. I love this wreath with the Wood Textures designer series paper! Lemon lime twist and Berry Burst create a vibrant contrast to the wood. A wonderful card just to let someone know you are thinking of them. But, change out the greeting and this would work for a Christmas card as well. See, versatile! Since this is the HOLIDAY Catalog showcase, I naturally had to make a Christmas card. I went with traditional green and red, but chose to work with bright and bold Lemon Lime Twist (I seriously can not get enough of this color!) and Poppy Parade. I love how the bit of striped Poppy Parade paper peeking out from the main panel echoes the striped Poppy Parade ribbon! The three little pearls were colored with my Poppy Parade Stampin’ Blends marker. Voila – perfect coordination! This would be an easy card to mass produce. Simple, but with some fun little details to make it interesting. That’s a wrap for me. I will now send you over to Twila who is showcasing one of my favorite sets – Dashing Deer. Thanks for stopping by! Come back again and join me in putting a spotlight on creativity! Time for a design challenge from My Inky Friends! For this challenge, we are featuring a square sketch, inspired by page 16 of the Annual Catalog. I decided to use some new items from the Stampin’ Up! Holiday catalog which goes live tomorrow! It is chock full of fantastic goodies for all of your holiday projects! For this challenge, I used the Dashing Deer Bundle – stamp set and coordinating thinlits – and the Joyous Noel Specialty Designer Series Paper. Oh. My. Goodness. It is sooooooo pretty! The copper foil accents are stunning. The vellum circle is cut out with one of the Stitched Shaped Framelits. The sprig is from the Frosted Bouquet Framelits (part of the Frosted Floral Suite) cut out of Copper Foil. For the Soft Suede strip I crumpled it up then separated the layers so it has a look of suede (difficult to see in the photo). I used the Bright Copper Shimmer Paint and the stylus end from the Take your Pick too. to put the copper details on the image at the bottom of the card. Finished project is a 5″x5″ card. I love the neutral tones on this. What a fantastic Christmas greeting to send. Head over to My Inky Friends blog and check out the other projects based on this sketch. I hope you will join us and play along. Create your project based on this sketch then upload a link to it on My Inky Friends blog to share it with us. We love to see your projects! Hey everybody! 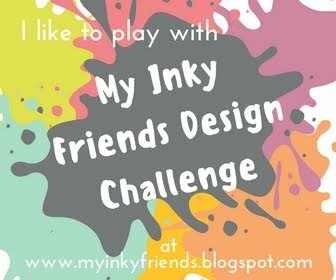 It’s time for another My Inky Friends challenge! This inspiration for this one is a color combo found on page 119 of the 2018-19 Stampin’ Up! catalog. I have to admit this was a tough combo for me. I wasn’t sure how to handle the balance of these colors. I finally decided less is more and went with a white back ground and small amounts of these colors. I embossed a white panel with the Pinewood Planks Textured Embossing Folder. I wrapped a bit of the Night of navy Gingham Ribbon tied offf with some Linen Thread and layered it on a Whisper White card base. I cut out three leaves from the Tropical Thinlits in Soft Suede, Old Olive and Grapefruit Grove and centered them on the ribbon. The sentiment is from Tropical Chic. I masked off part of it, stamped it in Night of Navy ink, and fussy cut around it. It is popped up on dimensionals over the leaves. The finishing touch is the three Grapefruit Grove pearls from the Share What You Love Artisan Pearls. Head on over to My Inky Friends blog to see what the rest of the design team did with this color challenge and then play along. I’d love to see what you come up with! It’s good to be back blog hopping with My Inky Friends. This time we are spotlighting some of the fabulous NEW Stampin’ Up! colors. Stampin’ Up! has done a color revamp and it is fabulous! They have introduced ten BRAND NEW colors and brought back six former In Colors to the core color families. Plus there are five BRAND NEW In Colors! So. Much. Color!!! I LOVE IT!! You may have arrived here from Yapha if you are following the hop in order. (or from Sharleen if you are being wild and crazy and doing the hop backwards). Today, I get to put the NEW Mango Melody center stage. This is such a fantastic cheerful color. This first card let’s this color introduce itself with the help of the Delightfully Detailed Laser-cut Specialty Paper. The sentiment is from the Stitched All Around stamp set. I cut out the label from the coordinating framelit set, Stitched Labels. between the framelits and the Laser cut paper, the work is done for you! Just throw on a few rhinestones for some added bling and voila! For the next card, I added in a bit of Basic Gray and the Dandelion Wishes stamp set. The patterned paper strips are from the new 6″x6″ Designer Series Paper, Brights and Neutrals. For the last card, I cast Mango Melody with fellow NEW colors Gray Granite and Granny Apple Green. They take the stage with the Healing Hugs stamp set. The card base is embossed with the Basket Weave 3D Dynamic Textured Impressions Embossing Folder. This cheerful color combo should brighten anyones day! Now, head on over to Sharleen. She has some great projects featuring the new In Color, Pineapple Punch. Be sure to follow the full blog hop circle for great color inspiration!